DISCLAIMER: Growing Awareness Pty Ltd as publishers of this web-site do not dispense or recommend medical or psychiatric advice, nor prescribe the use of any technique as a form of treatment for any diagnosable medical or psychiatric conditions. Any such action should only be taken either directly or indirectly on the advice of a physician or a qualified therapist. As long as you give me permission in your e-mail to post your question on the forum page I will usually add a reply within a week. Sorry a private question (not to be posted) may not receive a reply for some time depending on how busy I am. If it's OK to publish your comments or questions on this site please include your permission for this in your e-mail. 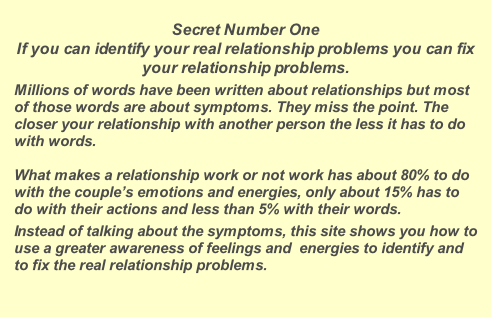 (Example: This confirms my permission for the following information to be published on the Growing Awareness Series website/s"
What are you experiencing as you identify your own relationship issues? How do you feel? What changes are happening in your life? Is it working? Share your experiences by e-mailing me. It is better not to include your full name in any material that will be published on the Internet. But it's great to include just your first name or a code name. One thing that is important is your general location. Examples: "Molly from Sydney NSW"; "Happy Now - Ontario Canada" or "Davy C, Alamo TX"
Making positive changes in your life the changes you want (the changes that will really make a difference) making changes the way you want to make them and at your own pace. Personal growth and freedom through self-awareness, and self-empowerment, increasing the number of positive choices you have in life. Making your relationships work. Partnering skills, developing intimacy, trust and stronger linkage. A good relationship is not one that is free of conflict or disagreement. My new site on Growing Your Emotional Age. My classic Voice dialogue site. Now updated with many new pages. If you are interested in the wonderful voice dialogue process this site is a must see. Is It Safe for me to Change here?